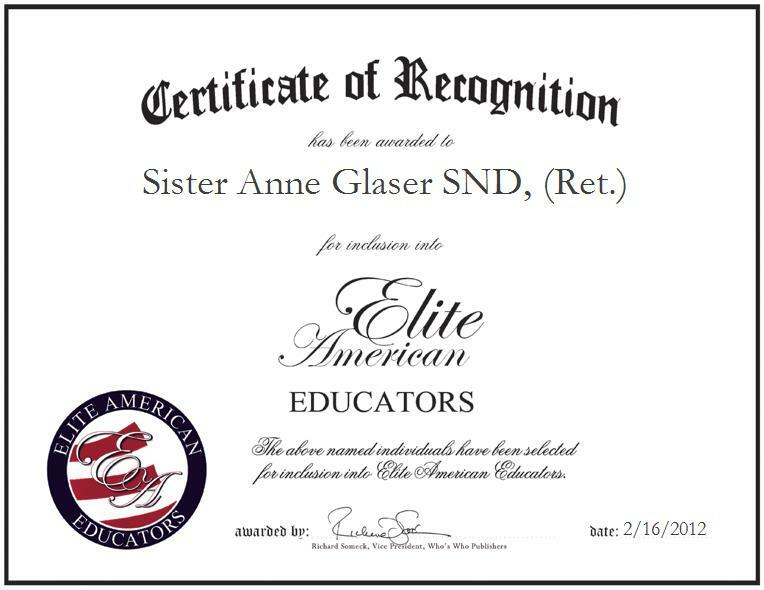 Sister Anne Glaser SND, (Ret.) is a Professional Development Coordinator for Cleveland Central Catholic High School. An expert on strategic planning, Sister Glaser specializes in creating service opportunities for new teachers and mentors, and she regularly presents an aspect of a learning environment at the renowned high school. She also meets faculty members in small groups, so as to facilitate interactive learning. Sister Glaser grew up in Lorain, Ohio. She was one among five children and attended St. Joseph’s Catholic School in Lorain until her eighth-grade and then moved to Notre Dame Academy in Cleveland, where she completed ninth through 12th grade. She has completed various training courses in different universities. She taught first to eighth-grade students and served as a principal for 24 years in six elementary schools and has also worked in the central office for 12 years.